The European Commission adopted on 19 April 2016 the communication “European Cloud Initiative – Building a competitive data and knowledge economy in Europe” that sets out a strategy to strengthen Europe’s position in data-driven innovation, improve its cohesion and help create a Digital Single Market in Europe. This is a fundamental step towards the reinforcement of the EU’s competitiveness in digital technologies and in innovation. The European Cloud Initiative will provide European science, industry and public authorities with world-class data infrastructures, high speed connectivity and increasingly powerful high performance computers. It will make it easier for researchers, businesses and public services to fully exploit the benefits of big data by making it possible to move, share, re-use and process data seamlessly across global markets and borders, and among institutions and research disciplines. The initiative will establish the European Open Science Cloud (EOSC) as a virtual environment to store and process large volumes of information generated by the big data revolution. This will be supported by the European Data Infrastructure (EDI), deploying the high-bandwidth networks and the supercomputing capacity necessary to access and process large datasets stored in the cloud.Both the EOSC and the EDI will build on existing EU-funded e-infrastructures and will bring networking, data and computing services closer to European researchers and innovators. 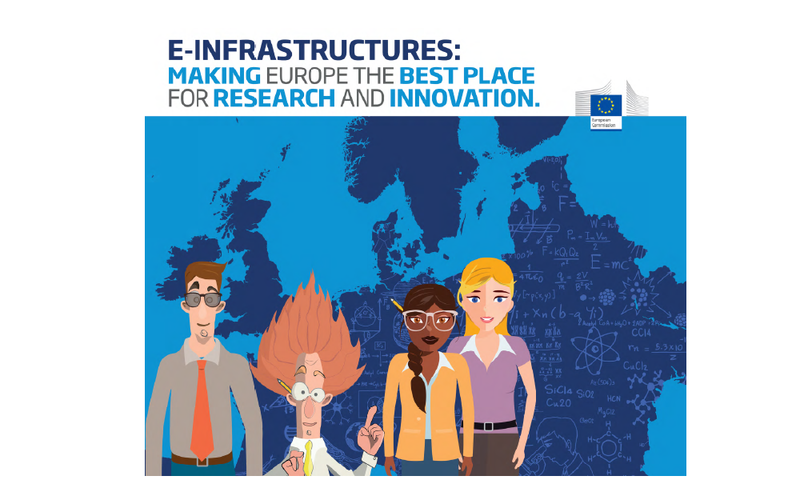 Today, EU-funded e-infrastructures play a fundamental role in the life of European researchers and innovators. This booklet illustrates that by showing how e-Infrastructure projects funded under the Horizon 2020 work programme 2014-2015 are helping researchers tackle the challenges posed by one specific societal challenge: climate change. After having read the whole story, you will not only have a better understanding of how European e-infrastructures help researchers and innovators do their work, but you will also see how they will contribute to making the EOSC and the EDI a success.